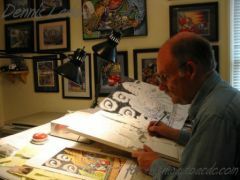 Dennis Larkins, designer for the " Day On The Green "
- Hi Dennis How did you become an illustrator? As an artist, I’ve always worked in a “narrative” style, whether working directly in the landscape, as in my early painting career, or later, creating juxtaposed metaphors using images from popular culture. My first commercial illustration jobs were in the early 1970’s sketching rock & roll stage design ideas for Bill Graham in San Francisco. - Your illustrations are inspired from the 50/60s style (the War of the Worlds, the fera from the other). Where is this coming from? I assume the “illustrations” you refer to are actually my personal paintings (as seen in the “fine art” section of my career portfolio website, http://www.startlingart.com or my print site, http://www.dennislarkins.com). The concept is to use fragments of images from retro-pop sources (advertising, pulp, comics, etc.) as elements of a shared cultural vocabulary, to create an allegorical narrative intended to inform aspects of our current time. - How did you end up working with Bill Graham? In early 1973, I was working as a scenic artist in the scenic shop of the San Francisco Opera and began “moonlighting” scenic painting (rock & roll backdrops, etc.) for Bill Graham Presents. - What was your exact role? 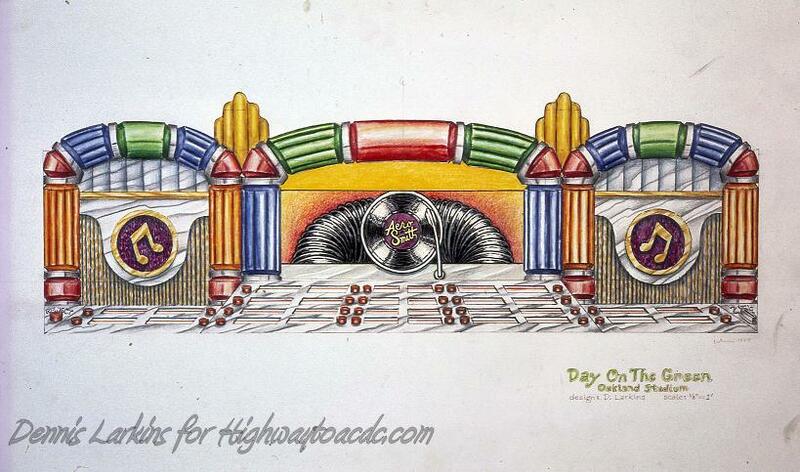 In the early days, I was their primary scenic artist, art director and painter of all things decorative for various S. F. Bay Area concert venues (Winterland, The Fillmore, Day on the Green, etc.) as well as BGP produced tours. By early 1977, I had also become their stage set designer and helped build a full service theatrical production company (FM Productions) as resident designer and head of the scenic department. - How did you manage the Day On the Green events? With all the bands, different stages, it must have been a huge load of work and must have required a lot of reactivity. How did you manage this? 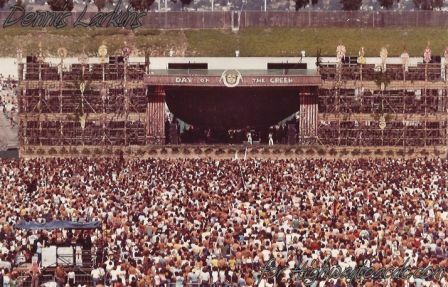 Day on the Green events were huge productions and required the full participation of all management and production aspects of BGP and FM Productions as well as many private contractors. My role was as described in the previous paragraph. - Who was taking the final decisions? was it Bill Graham? Bill was, of course, ultimately in charge of the event but surrounded himself with many talented and capable people entrusted with implementing all the various tasks necessary for the successful completion of such a large and complex undertaking. 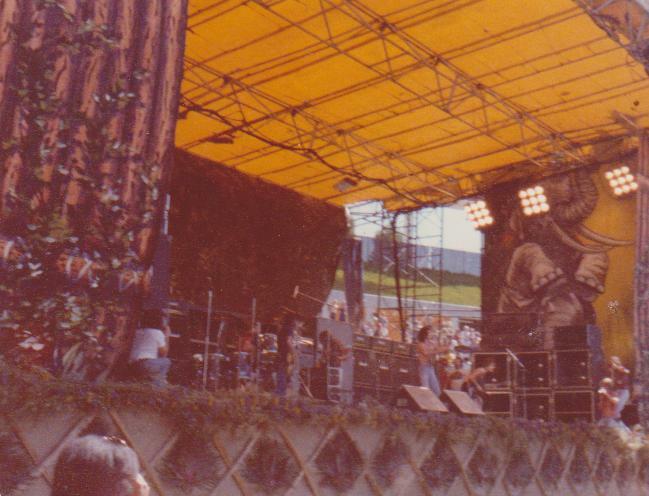 - Can you explain us the choice of the stage illustrations every time AC/DC perfomed for the Day On the Green festival? -7/23/78: The stage set we called the “Juke Box” was first used for this DOTG at which AC/DC was the opening act. This set was intended as a “generic”, all-purpose R&R environment and, to that end, was also used in 1979 for “Funk on the Green” (8/4/79) and a festival style event in Sacramento, CA either in ’78 or ’79. -9/2/78: The “Rumble in the Jungle” DOTG set was a last minute thematic switch from another design originally intended (see story, next section). This was AC/DC’s second appearance of the year at DOTG and they performed after Cheap Trick, the opening act. 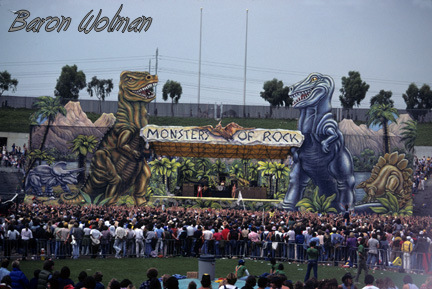 -7/21/79: “Monsters of Rock” was another thematic design intended to create a visually interesting environment suitable for all the acts scheduled for the day. 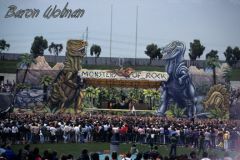 At the time, the show title was also a kind of “inside joke”, meant to refer not only to the rockers performing on stage, but also to all of us who joined forces to create such monumental events! -The Stage set was designed for a one an only use. What happened to them after use? Were they stored or destroyed? Most DOTG sets were one-time use only. They were stored as part of the BGP archives but, unfortunately, most of my set pieces were destroyed in an arson fire (I think in 1980) at the BGP offices in San Francisco along with hundreds of irreplaceable pieces of memorabilia from Bill’s career. - Did you attend the shows and have you met some of the bands? 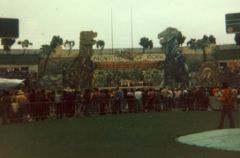 I attended most of the DOTG shows from 1974 through 1981 as art director/designer. I rarely met with the individual performers as my task was to help with overseeing all of the decorative elements. This generally required a continuous presence on-site from the previous day, through the night installation and during the all-day show. - Do you have any anecodtes about the Day On the Green events you wuld like to share with us? 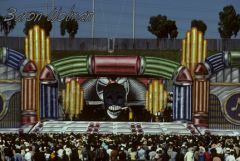 A situation occurred during the final days of painting the set for the 9/2/78 DOTG, originally themed as a “Rock & Roll Circus”, I got an urgent call from Bill Graham wanting to know if I could change the circus clowns in the design to “attack dogs”! He had shown the set design to Ted Nugent (the headline act), who instantly “freaked out” and demanded, “if the set has clowns in it, I’m not going on!” As the production was nearly complete, with only four days until the show, this request was, of course, impossible. In response we all immediately went into “crises mode” and changed the design concept to “Rumble in the Jungle” by using elements of the circus set (charging lions and tigers, etc.) and dressed-up cargo netting with a new proscenium and logo over the stage. 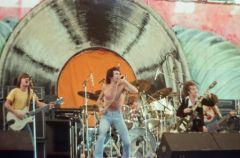 The next year (1979) the Rock & Roll Circus set was used for a different show and the scheduled Nugent event (with Aerosmith, AC/DC, etc.) featured giant dinosaurs in a Pleistocene landscape. It was called “Monsters of Rock”. -If you had to pick one performance of the DOTG events, which one wuold it be and why? In retrospect, I’d have to say that my favorite performance during my DOTG time has to be the 1977 Led Zeppelin concert. As it was also the last American appearance by that legendary group, it also has to be the most historic. - Is it true that all of the Day On the Green concert series have been filmed? As far as I know, surviving films of DOTG concerts are very rare. 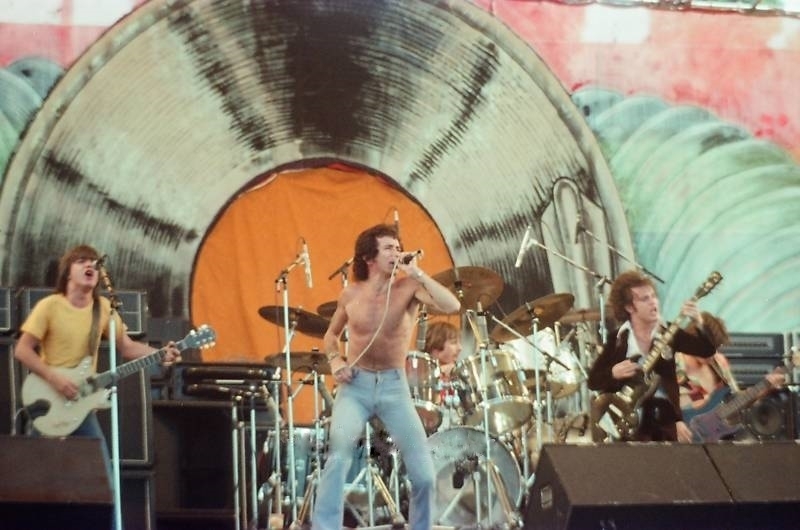 -What memories do you keep from AC/DC's performances in 1978 and 1979? have you met the band backstage? I never had the opportunity to meet AC/DC at the shows but I remember being very impressed with their music. They did instantly become the favorite band of my young son at the time! - Except the DOTG stages, have you created any other stages for other bands? 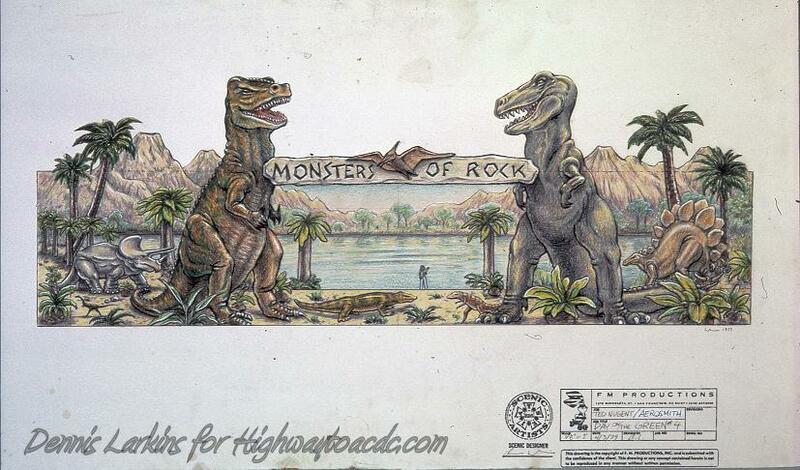 Did you keep pictures or drawings of these? During the same era (1970’s), as resident designer for FM Productions in San Francisco, I designed and we produced stage sets for many of the top name acts in R & R. I have a few pictures of some of these but most of the material remained in the FM archives after I left in 1980. As the company went out of business years ago, I don’t know what might have happened to the material. -What are your current projects? The most personally interesting thing I’m currently working on is my painting career (gallery shows, etc.). In addition to my websites previously mentioned, also check out a book about my work and history which was published recently, “STARTLINGART, Revealing the Art of Dennis Larkins”(Last Gasp/La Luz de Jesus Press), available on http://www.amazon.com/. I’m also occasionally creating original rock poster art for a California band called Moonalice (http://www.moonalice.com). Moonalice is almost single-handedly reviving the rock poster genre by commissioning many great poster artists to create new spectacular work for the band’s concert appearances (including many of the greats from the past like Stanley Mouse, David Singer, Wes Wilson, etc.). - What kind of stage would you create for AC/DC today if they were asking you to do so? Any contemporary design for a band like AC/DC would be based on the look of their current look, expressed through the sieve of my illustrative style, incorporating as much as possible of modern technology-an assault on the senses! - Thanks a lot Dennis for this interview.